Wind energy is an abundant source of benign energy, but conventional turbines are proving troublesome both ecologically and aesthetically. Ecology and aesthetics are not disconnected, and we believe that ways of extracting energy from the wind that are in closer concord with animal life will inevitably be more appealing to humans. 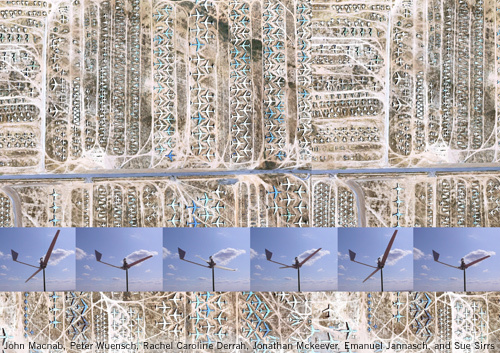 Wind energy is captured by a flight of reciprocating airfoils driving reciprocating pumps. Accumulated fluid pressure is released as required to perform mechanical work locally, or perhaps to generate electricity for transmission. Site specific work might include irrigation, water pumping or desaliniztion. High speed rotation is lethal to creatures in the air and unsettling to humans on the ground. Accumulating energy as hydraulic pressure allows us to reduce wing velocities. Organic mechanisms are not rotational but reciprocating. We find that reciprocating pumps can use heart-like bellows and flaps instead of discrete moving parts subject to friction and contamination. Driving pump-beats directly from wing-beats simplifies the device technically and animates it aesthetically. Artifacts and ideas are not unnatural, they are a component of nature, extensions of the same energy and information processes that we recognize as organisms and ecosystems. We are not externalizing nature and then imitating it. With this project we wish to demonstrate that we are one branch of nature learning to live in a healthier exchange with others. The suitability of reciprocating wind machines has been studied by Dr. Simon Farthing and his oscillating single wing pump (econologica.org) . The concepts are, by choice or time, in the public domain. Searches show our own bilateral system to be novel in design although we are not protecting it at present. The key to the Waterbirds porject technically and aesthetically are the wings, which we will make from aviation salvage. As the wings work on the upbeat as well as the downbeat, we will use symmetrical foils such as rudders and elevators. We are combing the world of high-tech salvage yards for more parts that are as beautifully made and as suited to their purpose.